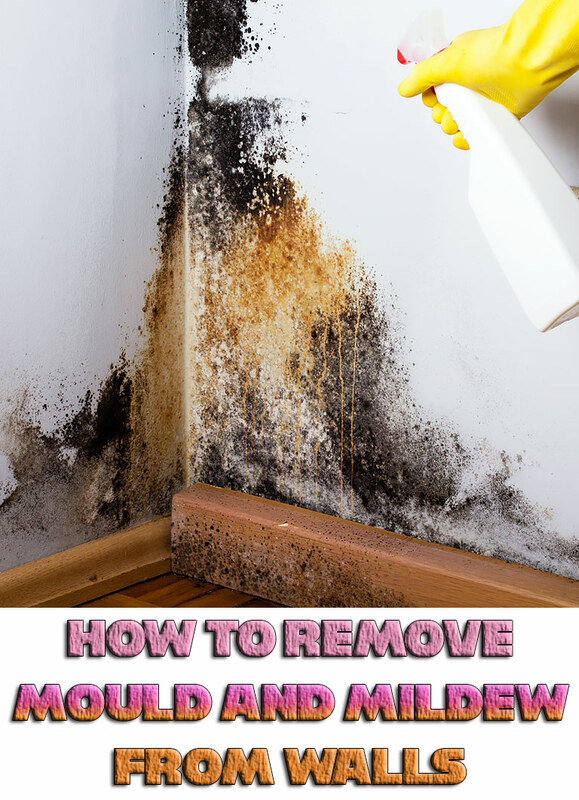 Use bright color liberally. Just as with natural light, the brighter and more saturated a color, the better. (It doesn’t necessarily have to be a light color!) 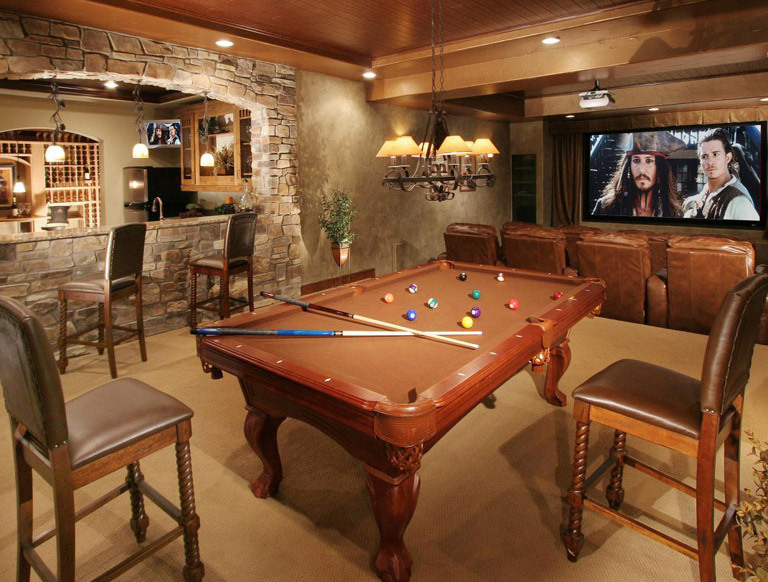 Not that you want your basement to be gaudy or tacky, of course. But a nice bright tone on the walls, rugs, and even large furniture pieces and some cheerful pops of color throguhout will go far in creating a fresh, bright atmosphere. 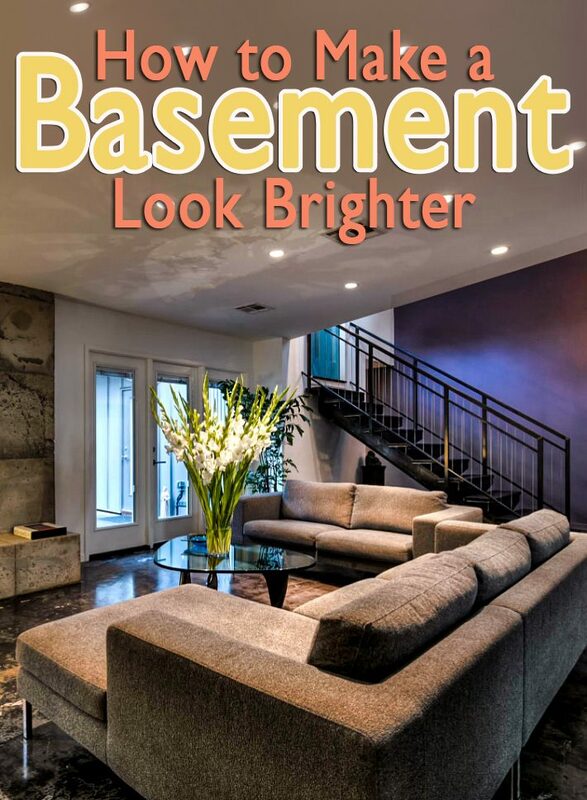 Choose a few areas or pieces in your basement to be darker for contrast. A large armoire, for example, or a side table or two. This will actually make the lighter areas seem brighter and will provide depth to the entire space. Embrace an open floor plan. Even in a room lacking windows, it’s a truth that expanded wall spaces will make the space seem bigger. 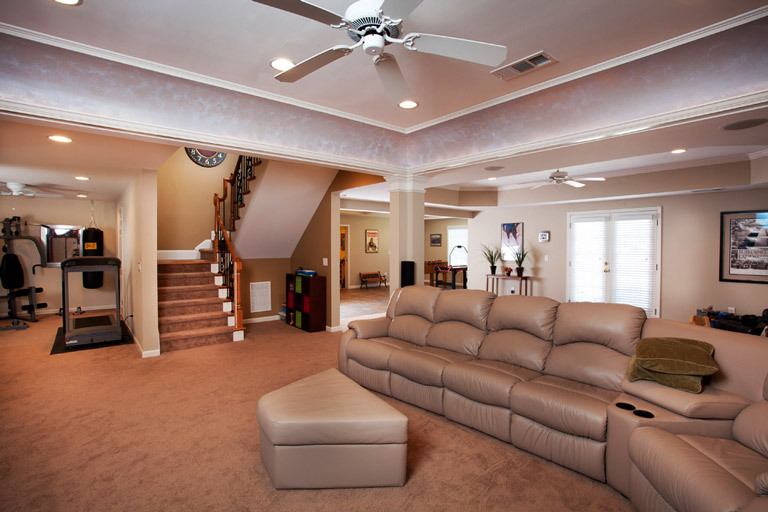 Consider taking out a wall or two to create a large living space. 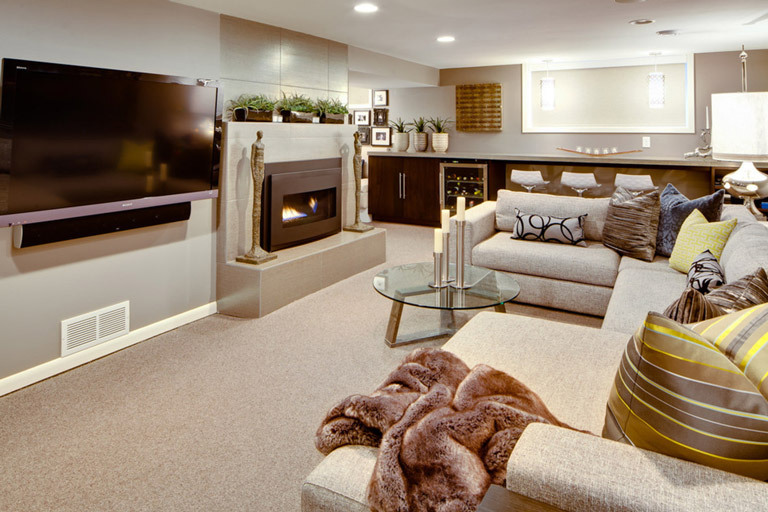 Not only will it look spacious and bright, but you’ll likely love the extra loving space to enjoy with family and friends. 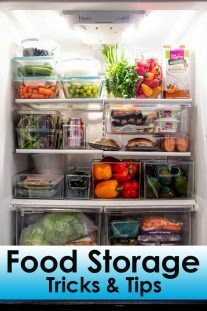 Clear out and organize the entire basement. Clutter inherently makes spaces feel crowded, which is exactly the opposite of what we want when we’re trying to brighten a space. 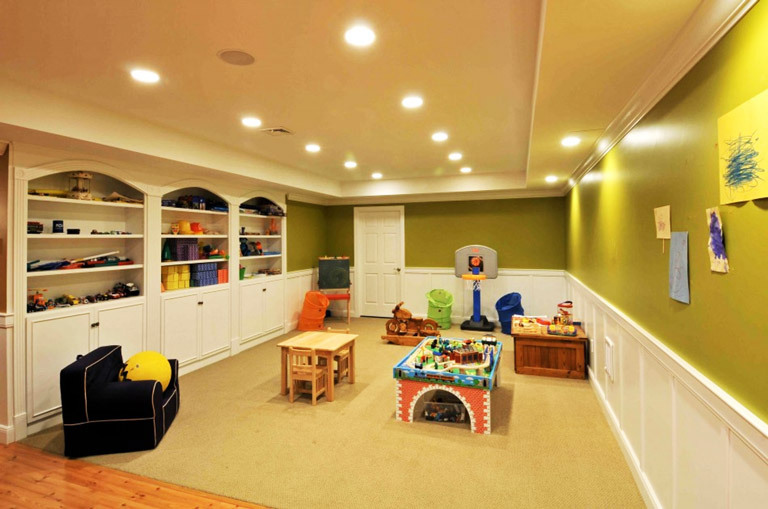 Clearing horizontal surfaces, choosing aesthetic and functional storage bins, and keeping things clean will go a long way toward brightening the entire basement. Many basements have lower ceilings, so hanging pendant lights can pose a problem, both aesthetically and, more important, functionally. 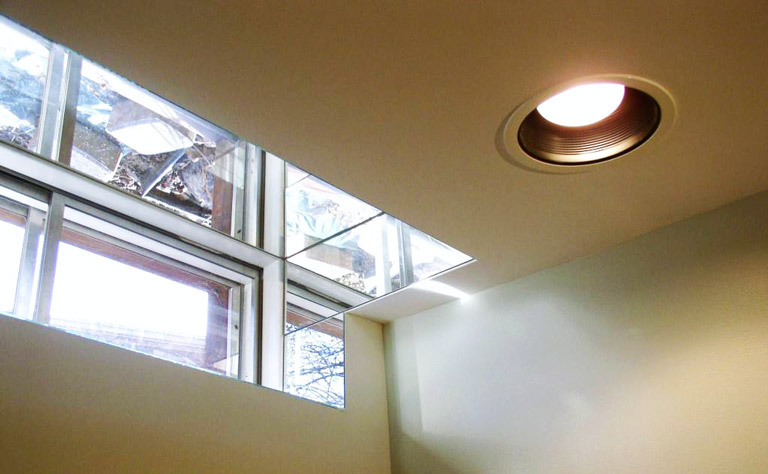 Selecting recessed lighting for the ceilings and adding in floor and table lamps, or some Great Wall sconces, will provide enough light without infringing on the vertical space. It sounds cliché, perhaps, but it’s absolutely true that by their very reflective nature, mirrors are instantaneously light-enhancers and space-expanders. 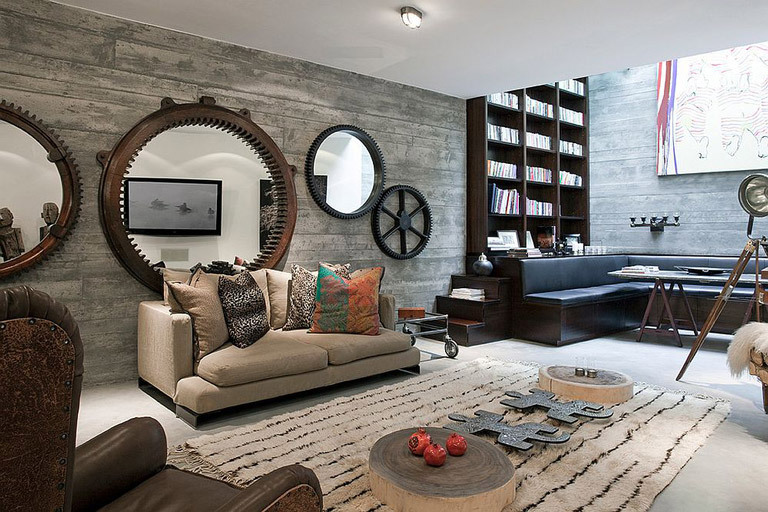 You could opt for floor-to-ceiling mirrors, if you want, but even adding in a few wall and shelved mirrors will do wonders in brightening your sans-natural-light basement. 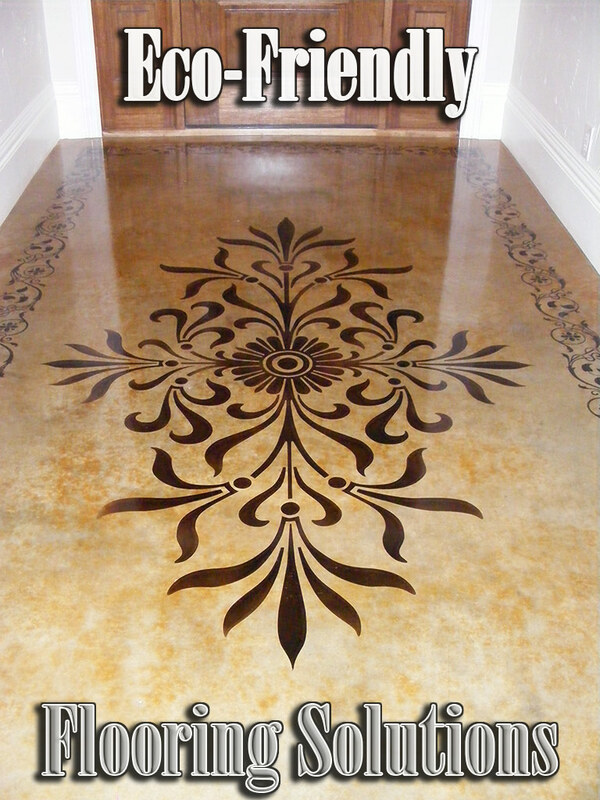 Don’t forget the reflective power of floors. 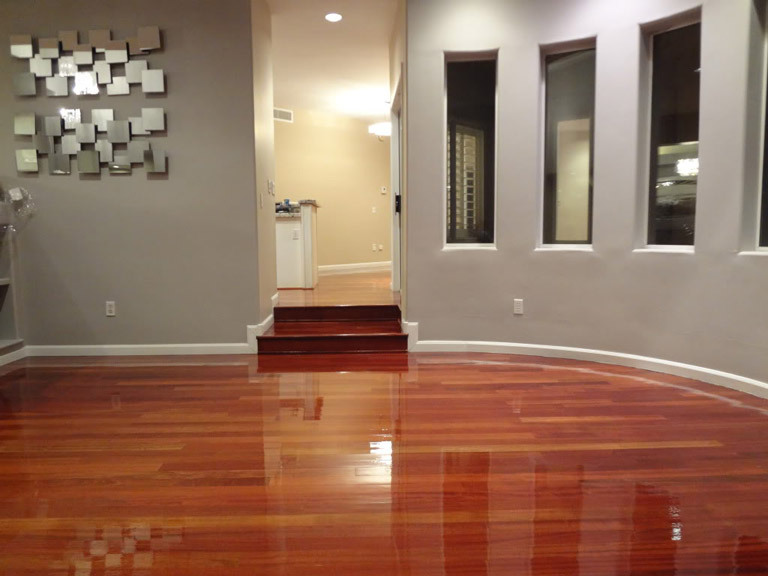 Polished hardwood, tile, and shined concrete are great ways to subtly bounce a little extra light around. Particularly because the floor is the direct reflector of ceiling lights. Continue the style from the rest of your house for consistency. 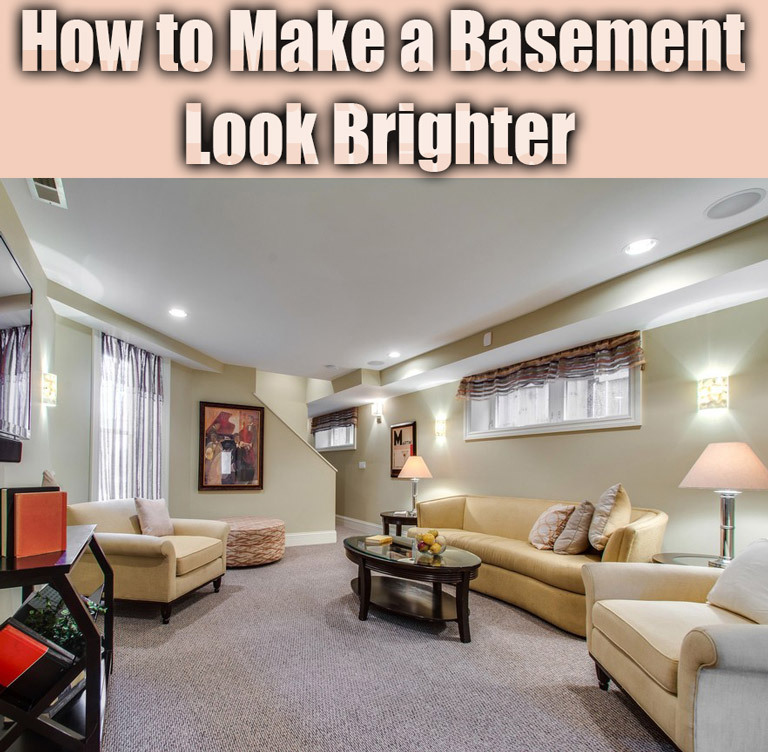 No one wants to feel like they are entering the depths of the dungeon when they enter a basement; the more seamless the transition can be from upper floor(s) to the basement, the more cheerful your basement will appear. 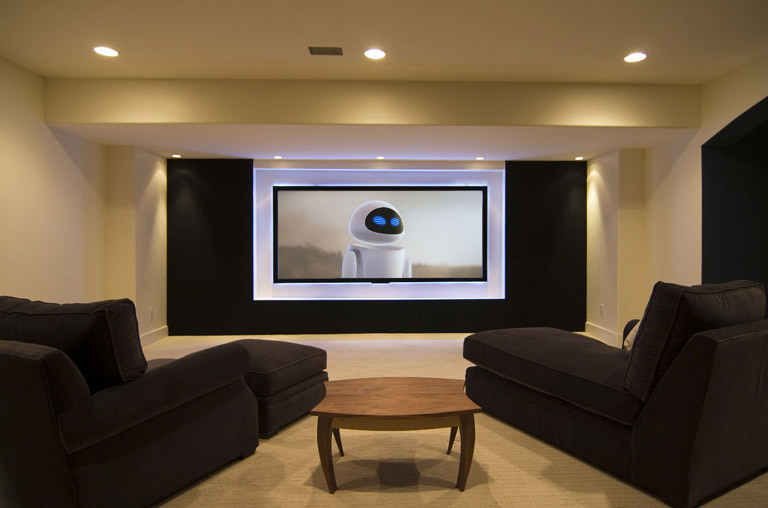 In their realm beneath the rest of the home, basements tend to be private getaway spaces for the family. 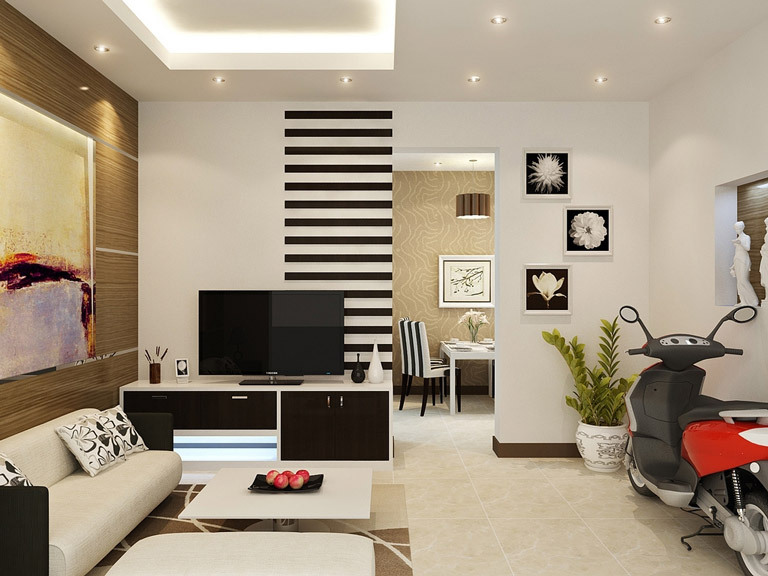 This is to your advantage as you work to create a bright, cheerful space. 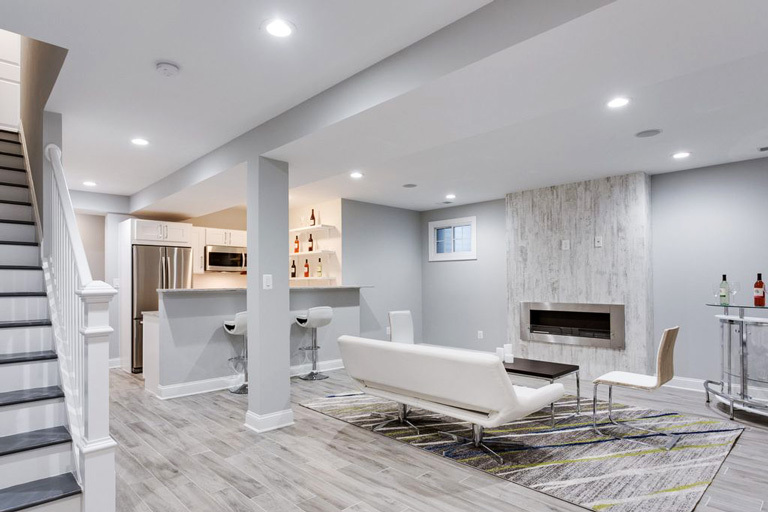 Furnish the basement in such a way that it’s a fun place to gather – include places for games, for reading, for watching television, for hanging out. Provide a venue where the inherent purpose is to simply enjoy one another’s company. Add in some curtains, if there are any windows at all. The punch of color and pattern on the curtains will help to brighten the space alone, but an added benefit of curtains is that they elongate the vertical space. For those basements lacking natural light, you could consider “creating” a fake one by hanging an antique window, or by mounting some curtains on the wall framing a mirror and a long slender wall sconce. The illusion will do wonders for brightening your underground space.